Bedroom is a space where we dwell and have a nap. We always make the room to look clean and classy. When compared to the other rooms bedroom consists of fewer elements such as bed, chaise, wardrobe and accessories. So, to make it look elegant we need to choose a simple and sparkling interior. False Ceiling has a great effect on the interior design of any room. False ceiling is either made of gypsum or wood with the ceiling lights, chandeliers, Pendant lights and string lights. Here are some designs of false ceiling to make your interior as the best one. Generally people use lights for a false ceiling because it plays a vital role to create aesthetic effect. Light fixtures are the sources which produces an artificial light and gives a cozy appearance to the interior. The light gets illuminated into the entire room and makes you feel pleasant. As we all know bedroom is a place where one gets a peace and refreshment. This design is the interior of a small space bedroom. Here as usual you can see a bed, couch wardrobe. 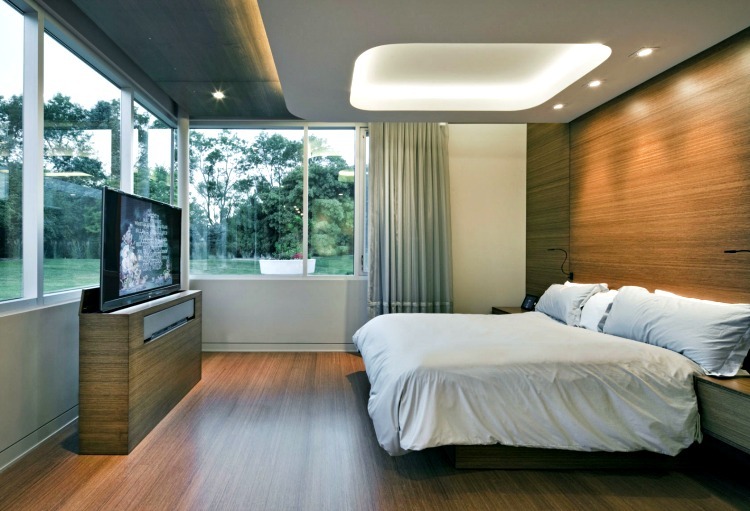 The false ceiling used in this bedroom is dropped ceiling where you can see a suspension of ceiling down to the structural ceiling and is a key to the interior design. It has ceiling lights which makes the interior looks bright and here the walls are decorated with snowy white and teal blue in contrast. The ceiling also gives aesthetic look and has closets, tv unit attached to the wall by wooden cladding. The casement windows has blinds and refreshes the room with the cool atmosphere. In this bedroom interior you will get an idea of wooden ceiling. The wood suspension from the roof with the ceiling lights looks amazing with a dramatic effect and has an extra large drum type pendant light mounted on the top with wood. The flooring is also made with the hardwood and has laid a textured plush carpet. The plaster paint wall paper on to the wall with mirrors looks amazing and changed the entire look of the bedroom. The room has windows and are decorated with the sheer curtains. It has a bed, couch, Tv unit placed on a table, lamp, cabinets, painting and is trendy. The bedroom looks modern and classic. The ceiling is tray type ceiling which is recessed and looks plain with the ceiling lights. It looks like a breakdown and differs in height to create architectural effect. Artichoke lamp has been attached to the roof and is pretty in structure. The room has a divan bed and it is a small space bedroom which has a Tv unit. The interior is decorated with the cabinets which has display items on it and the flooring has a saxony carpet and has windows covered with the draperies. 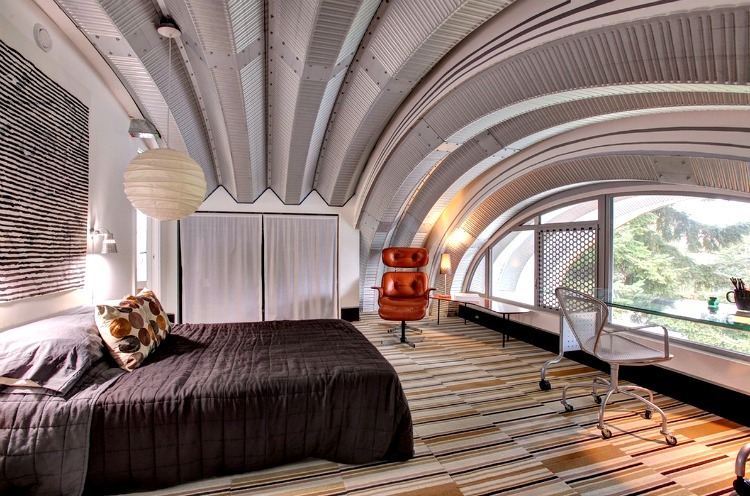 If you look at the ceiling of this interior it is adventurous and modish. The false ceiling is made of gypsum and is a suspension from the roof top which has ceiling lights. 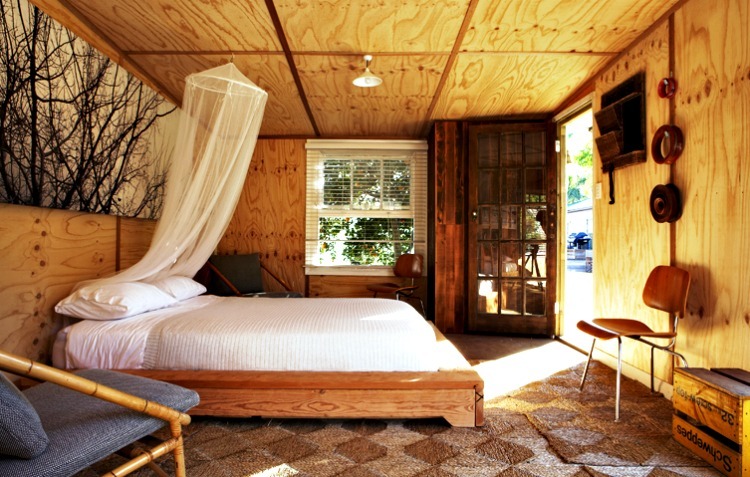 The room has warped wood cladding behind the bed and the flooring is also made of wood with a table and a Tv on it. The room seems to be natural because of the picture windows and the view the beautiful outdoor garden and can be closed with the eyelet curtains.If you want a simple and inexpensive false ceiling you can choose this design. The Pop ceiling is Plaster of Paris ceiling and is obtained from gypsum when water is removed in it. The pop ceiling is applied to the wood and is suspended from the roof which hardens with water. The false ceiling looks stylish with the contrasting colors and ceiling lights. The interior is decorated with the wall cladding and paneling and has a Tv unit, Painting. The canary yellow wall paper is sprucing the interior and the room has mid century modern couches with cream pillows. The flooring is made with ceramic tiles and has a grey carpet. In the view of the image you can see a wooden false ceiling and glossy panelling suspended from the structural ceiling with light fixtures and is amazing. The interior is decorated with dark teak wood and has fore front panelling with wood. The flooring is striped with wood texture and has a velvet plush carpet. The duvet on the bed is good looking with the pillows. The room has glass windows with outdoor view and the room has gallery frames, ornamental plants which gives a fresh look. The image views you a fantastic ply wood ceiling with the lights. The room looks taintless and hygienic in appearance. In the ceiling it was designed with wood for visual appeal. The bed is made with wood and has chest of drawers adjacent to it. the wall cladding is decorated on to the wall with ikea gallery on to the wall. The room has couch and a tv unit is attached to the cladding. The flooring is made of white ceramic tiles which gives cozy wall to the interior. The interior is simple and has wall lamps mounted on to the cladding. This image has Plaster board false ceiling which is easy to mould. The plaster used may be either heat resistant, cement, gypsum or lime.The plaster boarding is done in different designs with variety of colors. The roof is snowy white which has ceiling lights as well as hidden lights. The room is decorated with the texture wall paper and has windows with Tab Top sheer curtains. The bed is made of wood with a plain quilt and the flooring is made of walnut wood and has a carpet. In this image the entire interior is designed with the wood. If you want a false ceiling with plywood you can choose this design. If you are living in cold areas prefer these type of interiors which make you feel warm. This interior is simple with a monochromatic design of wood and looks classic. It has a frame with a theme of trees and has jalousie windows. You can decorate your room with display itms, portrait paintings, chaise and light fixtures. This room has a thick textured rug which gives comfort to your foot. This image interior is completely made of a metal. The metal panelling is usually used in machinery areas. Here you will get an idea about the interior design made with aluminium metal. This type of ceiling is used for sound proof and here there is a pendant light decorated on to the metal. It has a bed and has windows for outdoor view.This design looks ideal and has a carpet which is colorful.